All proposals must be submitted online through the Online Program Proposal System. No mailed proposals will be accepted. Click here for a blog post from Program Chair Asao B. Inoue with additional guidelines for CCCC 2018 proposals. As teachers, researchers, and administrators, we often imagine our work with and about language as work that transforms people, ideas, classrooms, disciplines, communities, and even society. Many of us imagine our work with language as work that revolutionizes—work that changes ideas and people for the better—but how might our work be more than its product or outcome? How might our work be change, be revolutionizing, be labors that are the practices of transformation themselves? How might we use our annual conference as a space for languaging, for laboring with and about language, for practicing transformation and revolution with and through language? Languaging—our laboring with and around language—is the center of what we do as teachers, researchers, and administrators of programs, departments, and centers of communication, learning, and research. 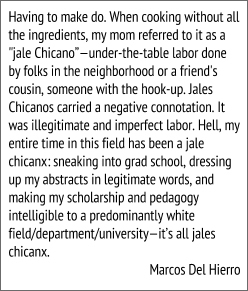 We usually call it rhetoric, or discourse, or writing, but really, rhetoric is just another way to name our laboring with words, with students, with community members, with texts. And while we might see the fruits of our language-laboring in a semester or over a few years in communities, programs, or classrooms, in students or colleagues, in ourselves, I want us to consider ways that the practices of languaging are the mselves transforming labor, and they may be the best outcome or product we might hope for in our research, teaching, or other work. In short, the fact that we language may be all we have for sure. For instance, what if the point of any writing class or article was mainly the languaging inherent in that work: writing the syllabus, reading and dialoguing with students over their languages, drafting and revising of an article or book, reading scholarship in the field, or listening to colleagues in meetings? What if the goal was the process, the labor, the languaging itself? How might this subtle change revolutionize us, our classrooms, our conference? We usually focus on something else that languaging gives us or produces for us, the article, the syllabus, the lesson or comment that is meant to help a student. What if we didn’t act this way? What if the point wasn’t the article to be published but engaging in articling, or syllabusing, or lessoning, or reading, or writing—in short, what if the point was the languaging? And what if that languaging could be labored at in com passionate ways that brought us together while engaging with our differences, be they racial, ethnic, linguistic, bodily, ideological, or something else. In a way, I’m arguing that seeing our diverse intellectual efforts as languaging is also to see our labors as intersectional. What if the key to a socially just tomorrow was really acting socially just today, changing the now structurally through attention to our languaging, being aware of our constellated histories as relatives and relations invested in collectively working to changing today structurally through languaging, through an acknowledgment that all labors and laboring matter and function in distinctive, rhetorical ways? My twin brother and I had a twin-language. That’s what my mom called it. I have only one, vague memory of it. I am standing on white asphalt, a driveway, next to my mom and my brother. I think it is in Dallas, Oregon, so I must be three o r four years old. I am saying something to my brother, my mom listening on, looking down and smiling but her eyes are confused. Her soft, warm hand rests on the back of my neck. She doesn’t understand what I’m saying, but I know she’s listening. I feel her warm, loving hand. My brother responds, and I feel the words like bubbles coming from my mouth. The act of twin-languaging was mouth acrobatics. I conjured the sounds from the back and bottom of the mouth, curling the tongue often, and drawing in the cheeks on both sides because sometimes the sounds came from the sides of our tongues, near the cheeks. Our voices would raise in pitch. This is what I remember of our twin-language, the language that nurtured my brother and me. I have only good feelings about it. It was fun to do, meant only to do, with my brother. But others heard us: “you shouldn’t let them talk like that.” As we grew into the larger social world, we quickly lost our intimate twin-language. 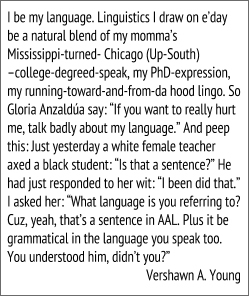 The language came and went like breath, sustaining us for just a moment. Languaging as laboring also points us to bodies in time and space, laboring bodies, so the verb of languaging—language as labor—has material, emotional, linguistic, and discursive dimensions. We perform languaging in the fullest sense that the verb can mean. We use o ur bodies to language. 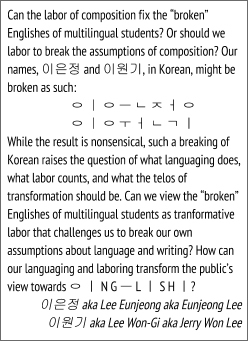 What implications might thinking about languaging as fully embodied labor mean? 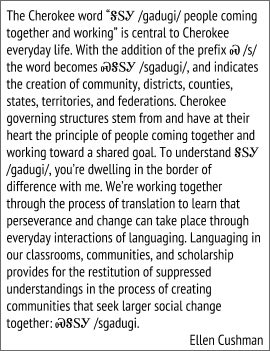 What might it mean to language self-consciously as transforming at our national convention? How might we transform our sessions and labors at our convention by conceiving of our languaging labors there as labors of transformation? Who or what might be transformed? 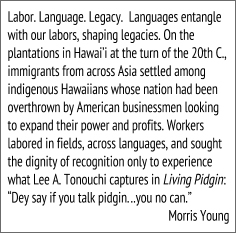 What new language-labors might we propose and engage in? How might our languaging there also engage deeply and meaningfully with the material and emotional aspects of languaging? What would happen if we wrote lovingly, loved how we wrote, asked students to do the same, designed courses and curricula with goals around cultivating or engaging with how language makes us feel and how we feel when we language? And so, as you consider your proposals for sessions and papers, consider them not as end products, not as panels and papers to propose; instead, think of your proposals as argument s for particular scenes of languaging and laboring. What languaging do you propose to have happen in your session? What would that laboring look like, feel like, sound like? Who would be laboring in the session? What might the experience be in that moment? 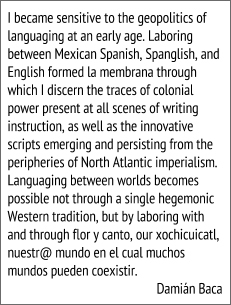 And how might that session be only about the languaging and laboring in that session? I urge us to be more mindful about what we propose, that we propose laboring and not simply papers, presentations, or products. I urge us to think of what we want to do at the conference as that, as doing, as laboring, as languaging that is the transforming acts that we hope for our conference and ourselves. I urge us to think of our labor together as communal laboring, as laboring done not just with others but for them. To facilitate this change in the conference, each presentation or session will have three hashtags associated with it instead of clusters. We will not use clusters. Ideally, all sessions will be pitched toward the widest and most general CCCC audience of writing and rhetoric teachers and scholars as possible, and will be judged by reviewers accordi ngly. I’m hoping this will encourage a more inclusive conference, one less fragmented, where folks who may not have engaged in some sessions in the past may do so this time, and one that is more intersectional in nature. These changes, I hope, will also capture the strongest and most compelling proposals. 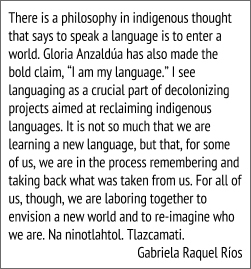 Thus, as you think about what you may do at our conference, consider ways our laboring with and on language might be processes of transformation, or the transforming of people, places, languages, ideas, ethics, classrooms, communities, programs, organizations, and ultimately our world. I am particularly interested in ways to transform the languaging and the languaging spaces of the conference itself, ways of bringing more languages in, code-meshed and mongrel ones, ones that open the borders of languaging in the territories we labor, not close them. I want us to stop focusing our view on the spot at our feet and see the wide and diverse landscape around us, explore, feel, and language with those not like us. Transform the languaging practices of the conference. Conceive and enact languaging at our conference in ways that transform us, our students, pedagogies, research, communities, and the organization and its spaces themselves. If the lab ors of languaging make, create, and destroy, how might knowing this—paying attention to our languaging as labor that defines and makes us and our futures, that destroys or harms us, that transforms—help us make more socially just futures at our national convention, or in our classrooms, in our work with others? How do we language in ways that are antiracist or decolonizing or working against gender binaries and harmful assumptions about sexuality or (dis)ability or resist patriarchal assumptions? How do we language in ways that do not oppress others? How do we language in ways that bring larger publics to our table for communion or take us to their tables? How might we use our time in Kansas City to labor for the urgent social justice issues that confront us today, in our classrooms, writing programs, communities, nation, and world? How might we language for human freedom? How might we language for now, this moment, in our bodies, as much as for tomorrow? Ultimately, I urge us to consider how our time together in Kansas City at our annual gathering might be conceived of and designed as laboring today, for today, and as a way of transforming us structurally. So come to Kansas City. Language with and for us. Let us language together, labor next to and for each other. 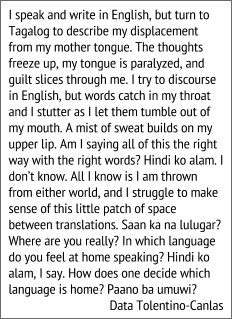 Let us transform our languaging, our conference, and ourselves.